How Hanuman Got the name Bajrang Bali? - Why Is Hanuman Known as Bajrang Bali? Bajrang Bali means the strong one and is a popular name of Hanuman. Legend has it that Hanuman was given the title Bajrang Bali by Devas or Demi Gods. It is believed that the Gods blessed Hanuman with immeasurable strength. Why is Hanuman known as Bajrang Bali? Hanuman in his childhood reaches for the sun thinking it to be a fruit. Indra uses his thunderbolt to stop Hanuman. The thunderbolt strikes Hanuman on his cheek and child Hanuman falls on to earth. Vayu picks him up midair and goes into a cave. An angry Vayu avenges this attack on his son by removing air from earth. Soon all beings suffocate. Terrified, Devas approach Brahma who tells them the reason. Devas blessed him with unfathomable strength, which will never diminish and Agni blessed him that fire will not touch him. 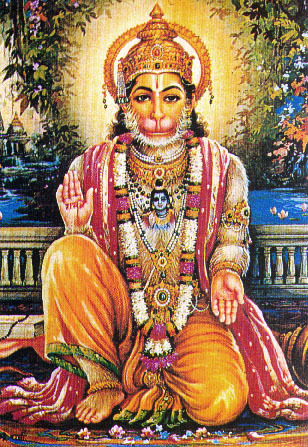 After attaining such powers, Hanuman was called Bajrang Bali by the Devas.